Steiff British Collectors Bear 2017 Discounts Apply ! Made from The Finest High Quality Antique Blond Mohair. 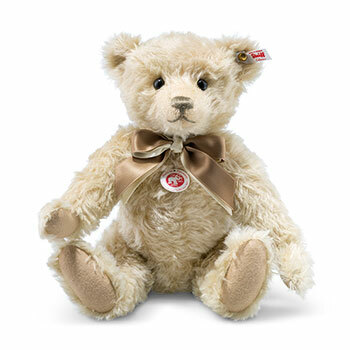 Born out of pure inspiration from the original Steiff Teddy bears from the early 1900s, Steiff have captured every ounce of magic, spirit, nostalgia and romance that Richard Steiff gifted his bears over 100 years ago. He wears the finest mohair coat which is exceptionally produced and skilfully woven. His deep set boot button eyes overflow with warmth, intelligence and never ending friendship. His heartbeat growls loud and proud telling us all just how honoured he is to join the celebrated series known as the Jewell in the crown of the collectors world. 5-way jointed with Safety Eyes and stuffed with Safety Filling, and with gold-plated "Button in Ear" with growler and Surface Washable. This Bear is part of Steiff's 2017 Exclusive range. Comes in a presentation box with certificate.